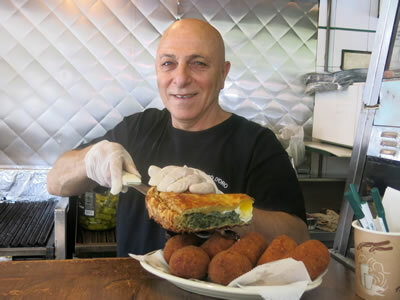 Delicious walking tours of New York City’s ethnic neighborhoods! and have a taste for adventure. For less than the price of a Broadway theater ticket you'll have a unique urban adventure with enough tastes to constitute a great meal! Each season of tours can take you through the richest ethnic neighborhoods in Manhattan, Brooklyn, Queens, the Bronx and Staten Island and, since 2014, tours in New Jersey of Newark's Portuguese and Brazilian Ironbound and Jersey City's ethnic treasures in Journal Square. .
Like Noshwalks on Facebook, there's lots of information not just on our tours but on other great food-themed events, sightings and developments in New York City! Send e-mail to noshwalks@aol.com with the names of tours you would like to take and a selection of dates. Noshwalks will try to accommodate you! Below are some comments from folks who’ve joined Noshwalks, along with some photos. Then click away through the rest of the Web site for more details (and pictures). I hope to meet you on a Noshwalk some time! Featured in the New York Times article, Changing Tastes, From Lingonberry to Baba Ghanouj. Excerpt: Myra Alperson is a matchmaker of sorts. Multimedia Slide Show A NoshWalk Through Bay Ridge She brings together people curious about exploring the city and introduces them to out-of-the-way neighborhoods they may never have visited. And like Napoleon's army, her crew travels on its stomach. Noshwalks Bubbly epicure Myra Alperson uses food—and lots of it—to draw crowds to out-of-the-way neighborhoods in all five boroughs. 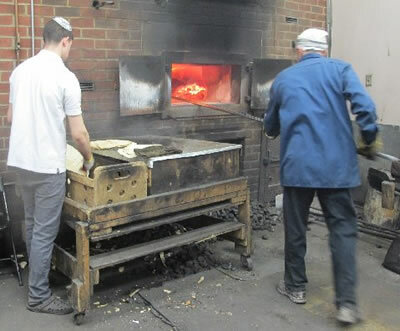 A typical Noshwalk tempts you with treats from bakeries, groceries and restaurants; on past jaunts, Alperson has taken tourgoers to a kosher matzoh factory in Brooklyn and a Sri Lanken market in Staten Island. Oh, and there’s some walking, too. 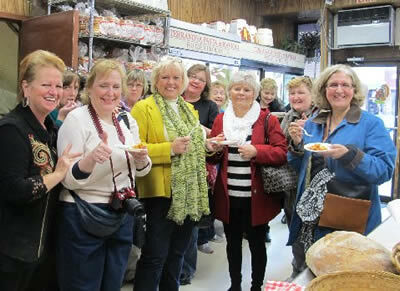 What a wonderful day we had with you on the food tour in the Bronx!!! ["Crossing 149th Street" Noshwalk] I knew the food would be great, but didn't know I would learn so much about the area that we saw as we walked and visited the neighborhoods. Thanks for all the insight into the people and places. Your passion for saving the beautiful structures, murals, etc. is refreshing!! [We] really enjoyed our afternoon in Astoria with you. I can fully understand why so many New Yorkers do repeated trips with you. I'm hoping that on our next visit to the city we'll be able to go exploring with you again. —Kathy P. and Larry M.
[My friend] really enjoyed the Lower East SIde-Chinatown Noshwalk. I think he initially came because I wanted to go and he was being polite. He's now a fan. Thanks! Myra, My wife and I enjoyed Sunset Park last week and want to thank-you for being our guide . Your passion and knowledge are clearly shared with everyone and have made us further interested in future walks. Thanks for introducing us to another interesting food neighborhood and a wonderful restaurant that we never would have tried without your input. 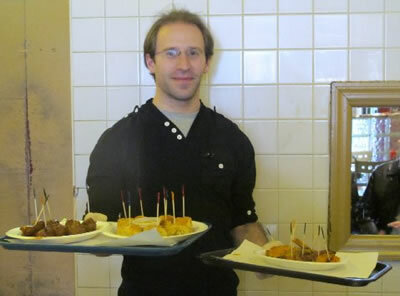 Noshwalks offer a chance to get under the skin of the REAL New York, and get a great meal as well! Your tour was absolutely marvelous - from the full report from Tom and Mike - and you treated them like kings! I simply cannot thank you enough for their experience! Both Tom and Mike were amazed at the architecture, neighborhoods, foods, and more. Things they just didn't think about would be in NYC or that would catch their eye if they decided, on their own, ‘so what shall we do and see today.’ Incredible. Your help with the subway and a million other little details was well beyond the norm. We had a wonderful time thanks to you! We would never have found as many terrific places! We wandered and noshed and bought treats to take home, and ended our journey back at Tandoori restaurant, where the owner seated us with another couple, who were immigrants from Tashkent. We had a great time with them, and stuffed ourselves with wonderful food - it was the perfect end to a perfect afternoon. Thank you again. — a visitor to NYC who toured Rego Park on a day when I wasn't available for a custom tour, so for a fee, I provided her with materials to take her own walk. Everyone was very impressed by the breadth of your knowledge — regarding shopping opportunities, food, synagogue history, etc. VERY informative! You really had EXCELLENT information and had clearly done your homework! I am still hearing from people when they see me that they really enjoyed the day. — a woman who hired me to lead a tour of Borough Park and Brighton Beach for a synagogue group of 40.